From cutting costs to increasing productivity- the cloud computing solution can help businesses in many ways irrespective of their size and scale. This is the reason why SMEs that sat on the fence for integrating the cloud concept in their system are now ready to embrace it. Most of the issues and misconceptions related to the cloud are now resolved and the technology is getting mainstreamed in the corporate world swiftly. As per the Statista survey, the market revenue for public cloud services is expected to exceed USD 278 Billion by 2021. 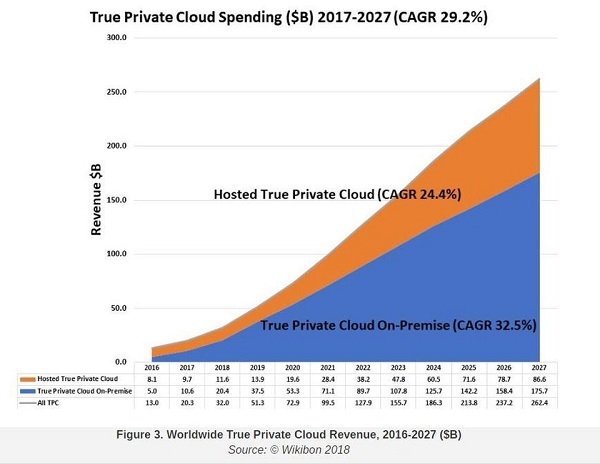 Similarly, Wikibon has projected that the True Private Cloud (TPC) market will reach USD 262B by 2027 with a compound annual growth rate of over 29%. These facts show the growing importance of cloud computing concept in the corporate world. As the technology matures, the confidence level of entrepreneurs increases in the cloud segment. Here we are going to delve into the ways through which cloud computing can cut down the costs of businesses. This is particularly useful for the small and mid-size enterprises as they face budgetary constraints and other limitations while competing with the established players. How to cut costs with cloud computing solution. Improved customer services and better accessibility can give a competitive edge to the small and mid-size companies over their large-scale competitors. If you can offer your customers a pleasant experience and better access to information continuously, chances are bright that you can achieve a loyal customer base. The cloud computing solution enables you to do so by setting up business operations in the cloud. All you can offer is a 24/7 virtual access to the customers on any of their smart devices. The cloud computing solution is the technology’s answer to data backup and downtime-related issues. In today’s competitive scenario, no business can afford to wait for completing the backup processes. Also, it is a costly affair to hire an IT expert for data backup for companies. There, the cloud approach offers a solution. It keeps the data accessible all the time while providing backups with zero downtime. In other words, cloud technology enables you to keep the backup without impairing data access. Security concerns for the sensitive corporate data always loom large on entrepreneurs. Thankfully, the cloud solutions provider can assist you to address these concerns. The cloud technology comes with inbuilt security solutions that are way ahead than your on-premise security features. The cloud technology offers encryption, multifactor authentication, monitoring tools, and compliance solutions to enhance the cybersecurity of your company’s digital assets. What’s more, the migration to the cloud is also not much expensive. When you consider its long-term benefits for your business, it is fair to mention that the cloud solution actually provides a high ROI over the years while simplifying your business processes and improving customer services. The cloud solutions provider can give useful information about the most suitable cloud-based solution for your business. The cloud professionals study your business model and requirements to suggest the right solution from various options like IaaS (Infrastructure as a Service), PaaS (Platform as a Service), and SaaS (Software as a Service). The good thing is cloud migration costs are mostly one-time expenses and the SMEs can readily avail the advantage of this technology. Switching to the cloud is a complex and time-taking process for the business. However, you need to put efforts and spend much of your time only once to migrate all the company data to the cloud. Once the process is done, you gradually experience comfort because of the automated processes. Here are a few aspects to keep in mind while you opt for the cloud migration. If your business generates extremely large files or deals with unstructured data like excessive Excel and Word files then you need to reorganize them due to size restrictions on the cloud. Bigger files take more time to load as compared to the smaller ones, therefore, the users may experience latency issues while accessing the large files. You can simply break the large file into multiple small files and archive older data that is not useful on a daily basis. The cloud solutions provider can help you with this task. The cloud technology is based on the Internet, and therefore, the reliable connectivity and particular speed are necessary to leverage the benefits. It is advisable to upgrade to faster internet and take measures to eliminate the possibility of an outage. You may need to add this cost in your overall cloud technology migration budget. But, it makes you free from any possible troubles in the future. Finally, the legacy workflows need to be updated. You need to keep your business processes in line with the new cloud-based backup procedures and security compliance. The cloud technology promotes paperless work, and therefore, a few small-scale businesses that rely heavily on the paper-based work may get failed to reap benefits of the cloud. The cloud concept offers a cost-effective solution for seamless data storage and access. It can help companies irrespective of their business model and other related factors. You can readily take your business to the next level with the cloud computing solution. Global software giants like Microsoft (Azure), Amazon (AWS), and Google (Google Cloud) spend a lot of bucks in making this next-gen technology more advanced than ever. In coming years, we can certainly expect the exponential growth in the cloud adoption rate globally. Large businesses can migrate their processes and data to the cloud is a story from the past. Today, even small and mid-sized enterprises can avail the advantage of cloud technology. All they need to consult a reliable cloud solutions provider. Such providers can assist companies to get an estimate of switching their business operations and software to the cloud at zero or minimal cost. From cost management to performance optimization, the cloud solutions provider can offer end-to-end cloud-based services to take your business to the next level. As a leading cloud computing services provider, Silver Touch Technologies offers cloud applications development, cloud IT, and cloud management services to assist you to make the most from the revolutionary cloud technology.